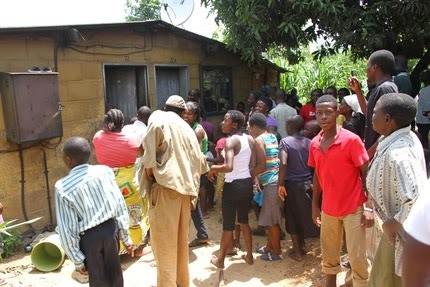 A Sakubva man was on Sunday caught being intimate with a 65-year-old granny while her ailing hubby was sleeping in the same room. A crowd quickly gathered at the house at around 1p.m after a neighbour who had heard squeaky sounds, raised alarm. Rebecca Govha who had had one too many with him before the incident. It is alleged that Chinamhora and Govha were under the influence of Zed when they were caught. Rebecca’s hubby of 40 years, Chitsa Govha was fast asleep right besides Rebecca on their matrimonial bed when the two were being intimate. The Weekender arrived at the house just when the egg-faced Chinamhora was trying to dress up. Rebecca was too drunk to walk or at least face her hubby and an agitated crowd outside. She suddenly shouted: “I don’t know what happened. I am drunk as you can see. 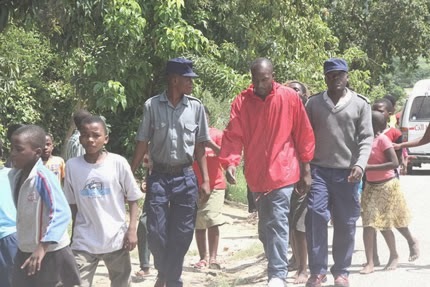 I can’t walk.” Police attended the scene and whisked the duo away to Chisamba Police station. Rebecca was, however, taken to the police station in a wheelbarrow. In an interview, Rebecca’s hubby, Chitsa struggled to compose himself as he failed to come to terms with his wife’s behaviour. “This is the greatest act of betrayal. I was asleep and never witnessed anything. As you can see I am not feeling well, I have swollen legs and I am on medication. I think my wife took advantage of this and bedded this young man. My wife is irresponsible. She is a beer guzzler and I am used to her drinking habits. This is unbelievable. See the way I am living. It is pathetic,” he said. One could not run short of superlatives to describe the couple’s room and standard of living. Chitsa, a pensioner and a former SPCA worker was seated on a base bed, with just one torn and filthy blanket. There was only a pot and a cup filled with dirty water. Neighbours had no good words for Rebecca who could not be reached for comment when The Weekender visited the place again on Monday. “We feel sorry for Chitsa. He is in trouble with Rebecca. She is always drunk. She wanders around Sakubva leaving her ailing hubby helpless. We knew about her illicit relationship with Chinamhora. “She is always seen with youthful men. Chitsa has not been feeling well and she has been neglecting her,” said a neighbour who requested anonymity.